2. Shift weight to left foot and lift right heel slightly off the ground as you turn fingertips inward toward body, then upward toward the sky and raise back-to-back hands until fingertips reach neck height with palms facing to sides. 3. Shift weight to right foot and lift left heel slightly off the ground as you turn palms first toward your body, then toward each other, then slide back of left hand under right palm as you turn your head to the left and raise your elbows to the sides so that forearms form a straight line parallel to the earth with overlapping hands in front of chin. 4. 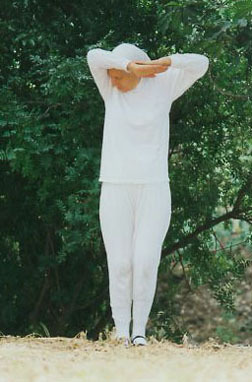 Form a Zayin by lowering your face between left wrist and shoulder. 5. Slowly shift weight to left foot, lifting right heel slightly, as you point fingertips of both hands forward so they are side-by-side, palms facing downward. 6. As you move head forward and lift it upward, circle fingertips downward and inward toward the body, and then upward toward the sky with elbows lowered and hands back-to-back in front of neck. 7. Shift weight to right foot, lifting left heel slightly, as you slowly lower hands until fingertips are at waist height and then let arms separate to the sides, keeping elbows slightly bent. 8. Lower left heel and shift weight evenly onto both feet as you turn palms toward the back with a circular motion until they come to rest at your sides with fingertips pointing toward the earth. 9. Repeat full sequence starting with opposite foot and sliding right hand under the left palm as you turn your head to the right in Step 3; then repeat sequence eight more times on each side. "Continuous Alternating Zayin": Form a Zayin with head on left side, and then after completing the movement on the left side in Step 7, instead of closing in Step 8, go directly from Step 7 to Step 1 and repeat the entire sequence on the opposite side, beginning by lowering your left heel, sinking weight onto left foot, and lifting right heel slightly as you bring hands back-to-back in front of body. Alternate sides until you have formed 18 Zayins; then after the last sequence to the right side, lower the right heel and shift weight evenly onto both feet and close as described in Step 8. Drawing warmth from the heated room during a cold winter storm. And opened the channels of compassion for all time. Until whatever fear remains dissolves into trusting Emunah.